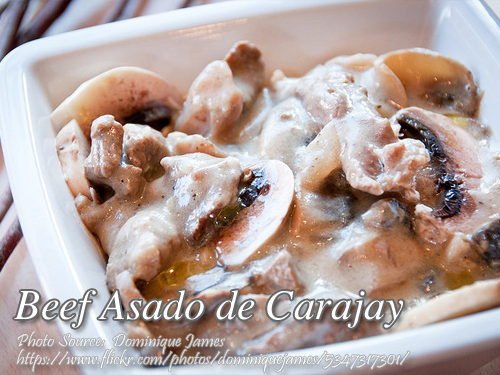 A delicious beef asado recipe with cream of mushroom and button mushrooms. Actually, the word “carajay” is a local version of the popular wok that is used in frying and stir frying your favorite dishes. There are so many local dishes the are cooked in that carajay but not sure this dish is called beef asado de carajay since it is pressure cooked. Only the sauce I think is cooked in carajay. To cook beef asado de carajay; Boil beef in water, soy sauce, bay leaves and peppercorns in a pressure cooker for 20 minutes or until tender. Remove meat and cool. Slice meat crosswise, 1/2 inch thick. Set aside. In a saucepan, heat butter and stir in onions until transparent. Add the beef slices. Pour the cream of mushroom soup and the beef broth. Let boil and lower heat to simmer until thick. Season with salt, pepper and sugar. Adjust seasonings to taste. Add the button mushrooms and serve hot. Slice meat crosswise, ½ inch thick. Set aside. In a saucepan, heat butter and stir in onions until transparent. Add the beef slices. Pour the cream of mushroom soup and the beef broth. Let boil and lower heat to simmer until thick. Season with salt, pepper and sugar. Adjust seasonings to taste. Add the button mushrooms and serve hot.